This is a perfect recipe for a Spring day – the weather doesn’t quite know if it’s hot or cold. There were bursts of sunshine which made me want a salad, but it was also wet, cold and windy at times which meant I didn’t want a completely cold meal. And of course, the wedding planning meant I needed something quick to make! This is fast, simple and will serve 4. It’s ready in 20 minutes. 1. Chop the red onion and red peppers, then add to a large pan with 1 tablespoon of the olive oil. Cook on a medium heat for 3 minutes until starting to soften. 2. Add the quinoa and cook for a further 30 seconds, then pour in the vegetable stock. Bring to the boil and allow to simmer for 10-15 minutes until the water has been absorbed. 3. Meanwhile, put a griddle pan on a high heat with the remaining olive oil. Slice the halloumi and add to the pan. Cook for a minute on each side, then take off the heat. 4. When the quinoa is cooked, add the zest and the juice of the lemon and the chopped parsley. 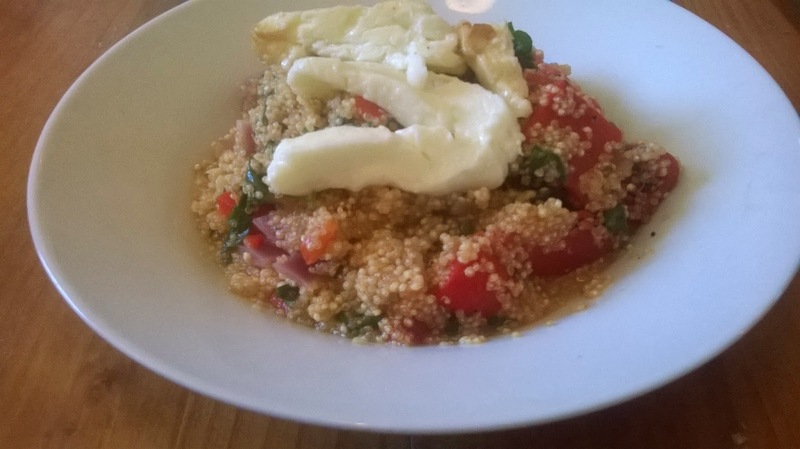 Serve the quinoa topped with slices of the halloumi.